Car management apps can stay linked to owners' phones even after the vehicle is sold to someone else, a computer security researcher has warned. IBM researcher Charles Henderson said his phone had stayed connected to a car for "years" after he had sold it. Mr Henderson called on car makers to do a better job of separating former owners from their vehicles. 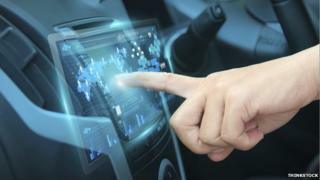 The research comes as Kaspersky Lab reports security problems with seven Android apps for cars. In a speech at the RSA Security conference, Mr Henderson said that despite selling a car years ago he still knew where it was because there was no process in place to unhook connected-car apps from former owners. "The car is really smart, but it's not smart enough to know who its owner is, so it's not smart enough to know it's been re-sold," Mr Henderson told the CNNTech news site. The link with Mr Henderson's phone persisted even though he had purged all personal data from it before taking it to be re-sold, he wrote on a blog about his discovery. He did not specify to which make of car he was still connected. Although there were processes in place to make sure all the keys to a car were handed over, manufacturers and car dealers had no way to disconnect car apps, he said. Research by IBM suggested many more "smart" devices remained linked to old owners when they were sold on, Mr Henderson said. "Don't assume you're the only authorised user of a smart device," he added. "Verify it." At the same conference, Kaspersky published research about problems with seven Android apps used to connect to cars. Six of the applications tested by Victor Chebyshev and Mikhail Kuzin did not encrypt user names and none had good protections against reverse engineering techniques or hijacking by malware. "An evildoer can covertly and quickly perform all of the actions in order to steal a car without breaking or drilling anything," wrote the researchers in a paper describing their work.